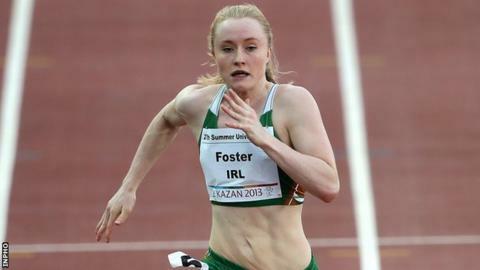 Amy Foster has booked her place at both the Commonwealth Games and European Championships after equalling the Irish 100m record in the US on Saturday. The Northern Irishwoman clocked 11.40 in Florida which matched Ailis McSweeney's mark set four years ago and cut .09 off her previous best. Foster's time also improved the Northern Ireland mark which she had shared with Anna Boyle. The City of Lisburn athlete, 25, had set her previous best three years ago. On a number of subsequent occasions over the last three years, Foster ran faster than 11.49 only to be denied a new personal best by wind readings. Foster's time on Saturday in the US exactly matched the A standard for this August's European Championships in Zurich. The Commonwealth Games standard in 11.45. Reacting on Twitter, Foster described her performance as an "awesome day". Foster, who is coached by David Reid, opened her current stint in Florida with two successive times of 11.50 before clocking a wind-assisted 11.38.